The Metropolitan Room is packed and excitement bubbles throughout the venue as we await Doreen Montalvo’s entrance. 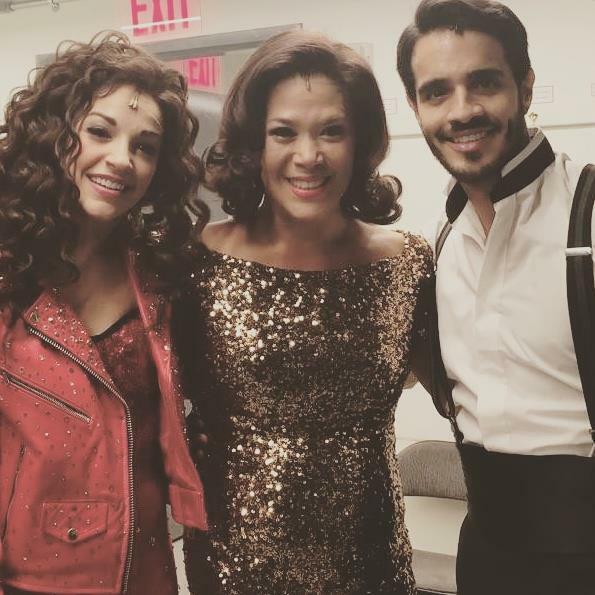 Montalvo, who recently replaced Andrea Burns as Gloria Estefan’s mother in the Broadway hit On Your Feet, has just released an album, seven years in the making. She jokes with us, “welcome to the birth of my baby.” It has been well worth the wait. Montalvo is stunning. Her voice is phenomenal and her heart shines through and through. Montalvo, who aptly titled her album “American Soul/Latin Heart,” starts the evening out with an inviting rendition of “Fever” by Eddie Cooley and Otis Blackwell. She connects with each and every one of us and the connection only gets stronger and stronger as the show progresses. She has the ability to get quiet and vulnerable and then take her audience on a wild ride of the heart as she belts from a place deep within. I was blown away by her arrangements of “Total Eclipse of the Heart” and “Piece of My Heart.” She sings in Spanish and English and is able to effectively communicate and tell her story in both languages. In times when the political climate of this country is shaky, it is a welcome respite to be touched by such a talented artist. With her moving arrangement of “What a Wonderful World,” she reminds her audience that there is hope and love can overcome anything, really. Her incredible seven piece band, comprised of a number of broadway musicians, features Geraldine Aiello on piano, David Fernandez (sax/flute), Teddy Mulet (trumpet), Irio O Farrell (bass), Manny Moreira (guitar), and Edwin Bonilla (percussion). Backup vocals by Barrie Kealoha Linberg and Florencia Cuenca, both terrific singers in their own right, add dimension and grace to the set. Montalvo’s music director and album collaborator, Jaime Lozano, leads the group beautifully. This live extension of Montalvo’s deeply moving and rocking new album is most effective. I’m hoping for a return performance, but in the meantime I urge you to go out and find her album and enjoy it as much as I have. 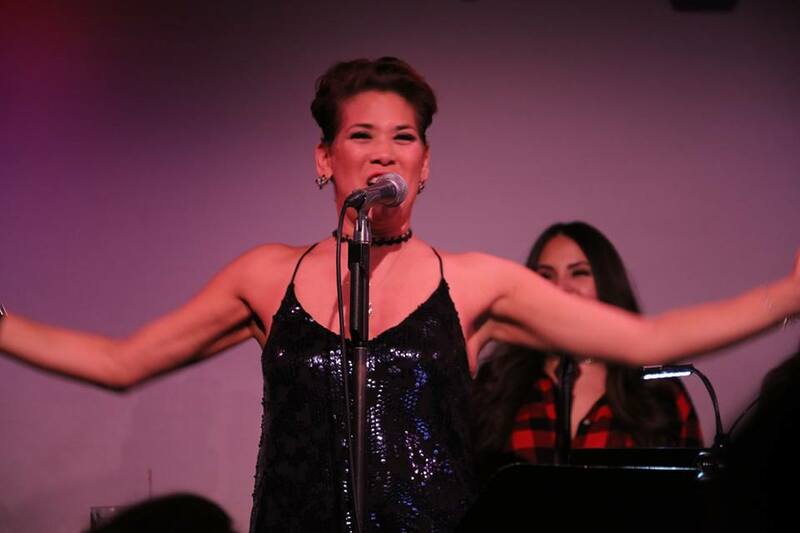 Metropolitan Room 34 W. 22nd St.
Could there be a more authentic and passionate singer than Doreen Montalvo? Her American Soul – Latin Heart CD release bash at the Metropolitan Room was a rousing success, spreading love and good humor as she poured out a program of Latino-inflected numbers backed by a superb band led by her Musical Director Jaime Lozano (who co-produced the CD). Her opening number, “Fever” (Eddie Cooley/Otis Blackwell), was different than the cool, worldly Peggy Lee version. Montalvo’s fever was almost distressingly real, stimulating already eager audience members who were equally receptive to her slow, passionate “Angel of the Morning” (Chip Taylor) translated into “Ángel de mi Alma” by the singer. The theme of her show was illustrated by several songs given Latino twists or new Spanish lyrics, such as “Total Eclipse of the Heart” (Jim Steinman) translated by Yurida, and “Piece of My Heart” (Jerry Ragovoy/Bert Berns), the Janis Joplin classic given a sassy treatment by Montalvo and Lozano. “Bésame Mucho” (Consuelo Velázquez), which she heard on an Eydie Gormé album, was the first song she sang in Spanish. Montalvo found all the sensuality in the lyrics, almost moaning them. Her two encores showed her both exultant and meditative about love. “You Don’t Have to Say You Love Me” (Pino Donaggio/Vicki Wickham/Simon Napier-Bell/Vito Pallavicini) took Dusty Springfield’s masochistic plea and turned it into physical need. She sang “What the Morning Brings” (Lozano/Tommy Newman) with a sly pleasure emanating from her eyes, finishing a powerful concert with a sigh, not a shout. Her band, assembled for this occasion, worked hand in glove with each other and Montalvo. 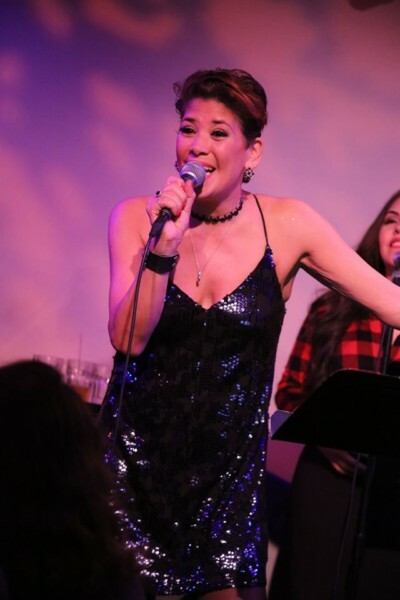 She wittily called them Doreen and the Sound Machine [a reference to Gloria Estefan and the Miami Sound Machine; Doreen has been an ensemble cast member of the Estefan bio-musical on Broadway, On Your Feet! 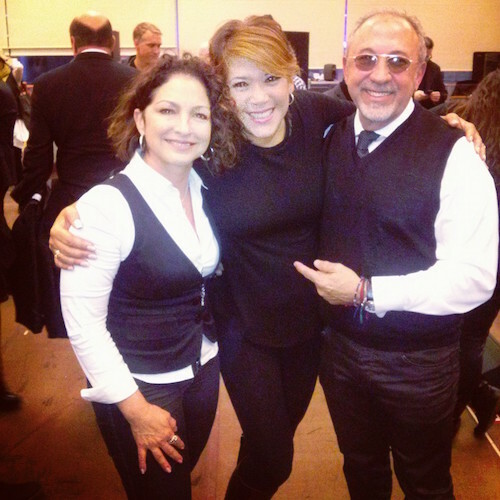 The Story of Emilio and Gloria Estefan and is now taking over the role of Gloria’s mother]! The band: Geraldine Anello (piano); Daniel Fernández (sax/flute); Teddy Mulet (trumpet); Irio O’Farrill (bass); Manny Moreira (guitar); and the hard-working percussionist Edwin Bonilla, brought in at the last minute. Her two in-synch backup singers were Barrie Kealoha Linberg and Florence Cuenca, each dressed in a red plaid shirt like the one Montalvo wore on her album cover. 54 Celebrates Eydie GorméAugust 16, 2015In "Cabaret Reviews"
September 24: Cabaret CaresSeptember 21, 2016In "New York City"
Broadway on 22nd, Metropolitan RoomSeptember 24, 2014In "Cabaret Reviews"
It was announced today that Doreen Montalvo will assume the role of Gloria Fajardo in Broadway’s “On Your Feet!” Replacing Andréa Burns beginning February 7th, this is Montalvo’s first principal role on Broadway. But, playing Gloria Estefan’s mother isn’t her only big news: Montalvo also released her first solo album, “American Soul / Latin Heart” on January 9th. On the album, the Drama Desk Award winner, who previously served as Burns’ understudy in “On Your Feet!” and “In The Heights,” provides listeners with a set of tracks that alternate seamlessly between English and Spanish. The result reveals a fresh, unique perspective and Montalvo’s distinctive sound – making it easily one of the best solo albums by a stage performer in recent years. We had a chance to catch up with Montalvo, who offered some insight into how she crafted the album featuring new, unexpected takes on classic songs by Styx, Consuelo Velázquez, Louis Armstrong, Peggy Lee and Bonnie Tyler, among others. She also revealed her expertise in playing “moms,” and more. Check out her answers and personal photos, below! What was the inspiration behind "American Soul / Latin Heart"? I have always loved classic rock songs, and Latin standards… they have been a part of my life since I started singing at five-years-old. [With this album], I wanted to fuse the two and make it a journey through the heart and soul of my love for classic rock songs and Latin jazz ballads. How did you reflect this balance of your roots in the song selections? When I was a little girl I used to listen to my mom and dad's record collection, and taught myself how to sing in Spanish. “Bésame Mucho” was the first song I ever learned in Spanish from an old Eydie Gormé album. That was the beginning of it all for me. I just love singing in both languages and fusing the two seemed like a perfect fit. Congratulations too on your big news at “On Your Feet”! How excited are you? 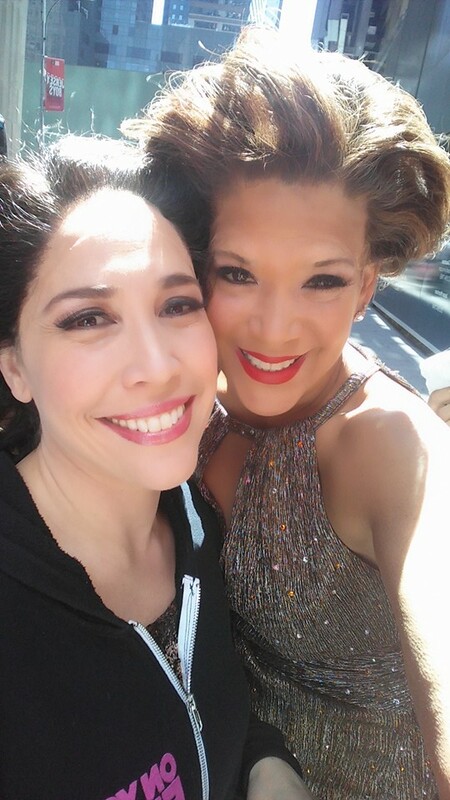 This past week I was offered to take over the role of Gloria Fajardo in “On Your Feet!” and am so very excited to finally be performing a dream of a role in my first principal contract on Broadway… taking the reigns from the incredible talent and my dear friend, Andréa Burns. As a prominent understudy up until this news, what was it like balancing your featured ensemble roles in some performances and playing Gloria Fajardo in others? Being an understudy and having your own daily track in a show can be very challenging. When I was doing “In the Heights” [also understudying Andréa Burns, playing Daniela], I covered three roles and I never knew who I would be going on for at any given time. With “On Your Feet!” I am the “mom” track: the Jewish mom [at the Bar Mitzvah] and Emilio Estefan’s mom, so that helps with keeping my maternal instincts in check! Understudying Andréa is a dream...she is one of the most gracious and generous actors I know, and watching her is a master class. I love playing Gloria Fajardo, she is the quintessential "old school" Latin mom: a tough mom who only wants what's best for her children. Although she may go about things with tough love, she clearly loves her children. My own mother was very much like her. She supported my talents but wanted me to keep it as a hobby...and become a schoolteacher, like her. When I decided to do this full time and took my first [union] tour, my mom didn't talk to me for two weeks. Eventually she came around and became my biggest supporter. Doreen Montalvo Mann will host a CD release party on Sunday, February 5th at the Metropolitan Room. For information and tickets, click here. For more information and to purchase tickets to “On Your Feet!” click here. Tickets to these high-scoring shows are always under 50 bucks! Read more here: http://www.miamiherald.com/2013/03/09/3276381/actors-playhouse-delivers-a-joyful.html#storylink=cpyMontalvo’s Abuela Claudia is the caretaker of memories, the loving elder we revere, then mourn. "Where Latinas Matter!" The ever talented Doreen Montalvo Back to Entertainment “Volvere” a must buy! Doreen Montalvo just released her debut album entitled, “Volvere” with Meme Solis. This 12 track cd will have one hand reaching for the ballroom dress in the back of your closet and the other for a glass of red wine. Doreen makes the listener feel artistic, romantic and spicy all at the same time. You can feel her soul singing in this album, so much to the point that you have a warm butterfly feeling in your stomach. The feeling is so hard to explain, but with a significant other in the room easy to express. You hear her sing about love and at the same time her voice embodies you with love. At one point hearing her music had distracted me from Mija for about 4 days, to write poetry. “Volvere” highlights a blend of classic romantic songs of Puerto Rico and Cuba. She worked with legendary Cuban singer/ songwriter, Meme Solis. My favorite song on the album is, “Que te pedi” where Doreen delivers a bag full of rising high and dramatic lows vocally. Who knows drama better than Doreen anyways? As you may or may not know she performed off Broadway performance as "La Lupe" in the critically acclaimed "La Lupe, Mi vida Mi Destino, as well as in the Hola Award winning performance as Cecilia in "Havana Under The Sea". Most recently she played the role of La Curandera in the World Premiere of Frank Loesser's new musical "Senor Discretion Himself. To get a first listen please go to http://www.cdbaby.com/cd/montalvo, but if you want to hear my favorite click here! Written by: Roberta Rosa Mija Magazine ©2005 All Rights Reserved.